When we launched the 80th year of the YCW in England and Wales, we asked for any stories about the peoples' experiences of the movement over the past 80 years. Below are examples of some of the wonderful responses we've had. Thank you to all those who have responded so generously. My memories start with the Pre-YCW when l was maybe 13/14 yrs. Old. How grown up we thought we were as this was a introduction to YCW which my older sisters were in. I know we had discussions about our faith and as Christians how we could help other people of the parish, which we did by doing odd jobs for our older people of the parish: shopping, filling the coal bucket, etc. I also collected the mission money with my older sister. I’m sure we had quizzes and played games and l remember sing alongside (probably hymns ). Once a year we would go to St. Dominic's to meet up with other YCW groups for a social night. By 15yrs old l was working, so I advanced to YCW which seemed to have more responsibilities. It was all part of parish life, school, Brownies, guides, Pre-YCW, Children of Mary, YCW, it was all the norm for families to socialise together. When we were 17/18yrs we were introduced to the parish hall socials, where our friend’s brothers taught us to dance. May....June we walked in processions singing hymns from church to a nearby house "The Croft" where we had benediction. Police controlled the traffic. I know Faith of Our Father by heart as you sang it like the national anthem after every event. Church was our second home. I’ll be 80 yrs this year and have enjoyed thinking back on what we thought were the good times ....no one had much but everyone shared. It was a great start in life for me and I am still living by the examples l was given. I wish you every success on the 80th anniversary. I was inspired to join the YCW by going to a study week in Hove/Brighton in Sussex in 1948 with a friend whose name is Bernie McIlroy. We stayed in a convent boarding school, courtesy of the nuns. We had brilliant accommodation, good food and beautiful surroundings. There were about 100 other girls there from all over England and some from European countries like Germany and France. It was there that we met Pat Keegan. It was a great experience for us and left a lasting impression on both of us. We were filled with enthusiasm. The week was set up by organisers like Betty Molyneux, Molly Madison and Eileen Frain, who were so dedicated that we couldn't help but be inspired by them. So we came back to Tyneside raring to go and we set up a section of the YCW in Hebburn-on-Tyne with five other girls - there were no mixed groups in those far-off days, of course there were plenty of boys' groups. It was still going strong when I left to marry Eugene Barrett, a fellow YCW member from the Seaham section, and it continued for several years. After our marriage, we joined the adult section, which was the family and social apostalate. We were members of this until we left Tyneside to live in Harpenden, Herts, in 1964, but we kept supporting the YCW in any way we could. Sadly, my husband died four years ago. Canon Cardijn (eventually Cardinal if I remember rightly) was a great man who introduced the church to quite revolutionary ideas, starting from the First World War, which reached out to young workers who were not only estranged from the church, but also working in very bad conditions with no regard for their dignity as human beings, just cogs in the wheel. He organised groups which made them aware of their rights and of the needs of their fellow workers and taught them that Christ would always want better for them and all workers. We were encouraged to strive for a much better world of work with fairness for all regardless of whether you were a Catholic. Personally, it transformed my whole outlook on life. I could then see the need for social justice, the importance of caring for all of those around us and the importance of trade unions and the raising of people's living standards. I knew people who, because of the YCW, went into local government and one was in Harold Wilson's Government. His name was Maurice Foley. It gave me a new take on Christianity and a true relationship with Christ. People of my age group on Tyneside were Mary Carty (Fitzpatrick), Bernadette Madigan, Pat Morgan, Jimmy Berry, Ronnie Brown (who became a priest) to mention a few. In my long life I haven't found any way of life that beats what I was shown in my youth. We went to other study weeks in Harrogate and Roehampton. They were our further education or university, with great benefits for all. So don't be discouraged - the YCW is a very important movement and very worthwhile. In the early 60s I was a member of the Pre-YCW and YCW in the parish of St Edmund's, Little Hulton. Our chaplain was Father Joseph ( later Dean) Loran, a man who loved and inspired so many young people by his great love of the YCW and its principles. I spent many happy times in my years in the YCW and as a group we worked very closely with other regions, namely Blackburn, Warrington and Bradford with Fr. Loran overseeing the activities of the regions. We would hold an annual get together and in turn each region would play host to the other groups for a weekend of spiritual and social activities, culminating in Sunday morning Mass. There was also an annual holiday where the four regions under Fr. Loran's guidance would come together for a week away. The one I attended being at Gormanston College in Co. Meath near Dublin. This was also made up of spiritual and social activities with Gospel Enquiries and See, Judge and Act being at the forefront of our days but also lots of time being free for sport and leisure events....a great time!! One of my special memories was attending King's Hall at Belle Vue in Manchester in May of 1962 and watching and listening to the founder, Cardinal Cardijn!! In fact very little was heard due to the non-stop cheering and applauding from the crowd each time the Cardinal attempted to speak.... a truly memorable day which I will always treasure. I will be seventy later this year but the time I spent as a boy/young man as a member of the YCW will remain with me forever and will always remind me of the impact its principles and teachings had on my life. Regards and best wishes to all YCW members everywhere. In 1959, I was fortunate to go with the YCW from Nottingham on a pilgrimage to Rome. I was 19 years old and was living in Leicester at the time and a group of us joined up with Nottingham for this purpose. We went by rail and the journey there was uneventful. However, when we arrived in Rome we attended Mass in several churches toured Rome at our leisure and thoroughly enjoyed ourselves. The most memorable moment was the torchlight procession to the Coliseum where we all attended Mass. I shall never forget that there were 87 different speaking nationalities and we all celebrated Mass in Latin. I shared my hymn book with an African girl and it was wonderful to think that we both shared this beautiful experience. I shall be 80 this year, but I shall always remember that Mass. On a different note, on the journey back there were two trains – A and B. I was on train A and it was de-railed at Hesdigneul in France. I was asleep in the luggage rack and on impact was thrown out of it and landed on the floor. Then we had to vacate the train and all gather in a field in the pouring rain, and pray that train B could be stopped in time. Our prayers were answered. Another train was sent for us and we continued our journey to England. The end of my story is that, through standing in the rain I caught Asian Flu and was off work for two weeks! Always Mass in the Coliseum will stay in my mind as a most wonderful uplifting experience. 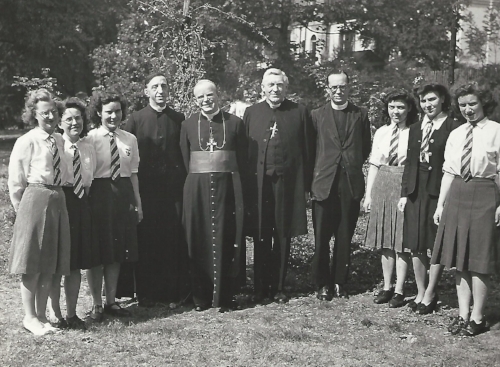 My first contact with the YCW was in 1952 when I was 14, I was asked to go to a meeting in our Parish for a discussion. The meeting proved to be about starting a Pre-Y section. There had been no previous contact with the YCW in the parish, The Holy Name, in Central Manchester. The section was started soon after. Over the following years I became increasingly involved at a section, region and eventually national level. Active involvement in the YCW for more than 15 years was such a large and important part of my life it is difficult to identify specific experiences or events that are more important than others. The reality is that the YCW increasingly became my life, it formed me, developed me, gave me confidence and enabled me to do things that a young person of that time, of poor education, would never have had the opportunity or inclination to do. It took me to places I could never have envisaged, going to, Rome in 1957 and subsequently visits to France, Holland and Switzerland. Each trip enhanced my development and formation and most importantly the practical experience of organising, writing, speaking, working in and leading teams of people. These skills played an increasingly important part in my subsequent life at work and in the communities in which I lived. Individual memories are difficult to separate from the whole as so many are important and remain with me but the one consistent element of my experience of my time in the YCW that stands above all is the people I met, worked with and admired. These memories encompass experience in teams in sections, in regions, and at a national level. The YCW was fantastic at building teams, helping people to work together to achieve common aims, to identify objectives and to deliver the best they can. Teams I have been lucky enough to be a part of have led to lasting lifelong friendships. Contact can be lost for a time but can be reignited at the drop of a hat, so deep have these friendships been they have been regained as quickly as striking a match. The YCW shaped me and shaped my life, it made me what I am as a husband, father, grandfather; it enabled me to achieve whatever I have achieved in my working, professional and community life. In addition it gave me the experience of truly lasting friendships. For me it truly was The University of my Life. I joined the YCW in September 1991 as a young single mother. I did not go to church but I was invited to a meeting at St Augustine’s parish centre in Darlington one Monday afternoon. At that time, I lived at home with my mum and my daughter Rachel. Her natural father had not been a presence in her life and seemed to exist for the sole purpose of causing me mental anguish. At the first meeting Ricky came along as National President and Regional Organiser for the North East of England; I was genuinely surprised by how much ‘this man’ seemed to know about the reality of young single mothers. The UK had the highest teenage pregnancy rate in Europe and did so for around 20 years. Young single mothers are likely to suffer from poor housing, low self-esteem and a lack of opportunities. Of course I knew all of this; I was living that dream. However Ricky then said ‘There’s no reason why any one of you in this room cannot become Prime Minister’. I was astonished and that comment has never left me. Moving on through the weekly meetings, the most profound experience for me was learning some of the writings of Fr. Joseph Cardijn, especially that ‘one young person is worth more than all the gold in the entire world’. I remember very distinctly that I would push my daughter Rachel in her little pushchair and try to imagine what ‘all the gold in the entire world’ looked like and then I’d say to myself, (given the poor self-esteem and lack of opportunity), that ‘I Angela Petty was worth more than all that gold’. I began to understand what that word dignity meant and that if I believed in my own dignity then it’s impossible to not treat others with the same dignity and respect. This was completely life changing, it changed my outlook, my beliefs about the world and how I viewed my own capabilities. The YCW really did change my life! I joined the YCW at St Bernadette’s, Whitefield in April 1982. I was 17 at the time and working as a warehouseman in an auction room in Manchester. I had flunked school and could have been described as anti-academic. The YCW encouraged me to think about what I believed and more importantly to learn to articulate it in not just words and sentences but also in actions. I was also at that time, with a nefarious gang of friends and was in a lot of trouble with the police, institutions and of course my family. YCW gave me a different view of the world and as it was so social and time consuming it offered me another and a better choice of lifestyle. From my local group I was eventually privileged to serve as a leader regionally, nationally and internationally. In the 1990’s I was asked to support the development of the movement in a host of South East Asian and African countries. This was a wonderful and profound experience in which I aimed to ‘give something back’. I am pleased to say that I have recently heard testimonies of growth inspired by those visits. In 2008, we lost our 18 year old daughter in a tragedy and perhaps the greatest gift the YCW ever gave me was delivered then, where I found the resolve and reflective capabilities to make sense of this loss and to help restrict its damage to others. The year is 1958 when I first heard of the YCW. Then in my last year of school I became a member of a pre-Y group in Gateshead. The following year my group went to Belgium on a National Study Holiday. As part of the preparation I was asked to give a talk in front of Mgr. Cardijn, although I now see that this event was the first of many times I spoke out. A journey had begun and part of it was to speak to those who could right things. During our teenage years the group became more active becoming enthusiastically involved with National Campaigns. One such programme was looking at the housing situation in the town. We surveyed the housing then located areas of overcrowding and poor housing conditions. We then talked to the residents to learn about the many difficulties families encountered. Our findings and conclusions were reported to the Local Council and representation made at the Council meeting. Through our weekly meeting our group learned of the Good News of the Gospels, faith and the Gospel values deepened in my life. The method of See, Judge and Act caused me and many others to go beyond self and discovered opportunities to be active at work and leisure. All this personal development went hand in hand with great friendships and enjoying good times together. A crowd of us from about six YCW sections went to Strasburg as part of the England and Wales contingent at the Rally of the European YCW in 1964. Much work went into preparing for the Rally. Great exchanges of ideas and meeting people from all over Europe were experienced. On returning to the North east groups of three participants visited every section to show photographs and report on the meeting. Periodically our group would look at the Mass in relation to our lives. It was an awakening, we did not only attend Mass - we were an integral part of it, bringing our efforts, struggles and hopes to be blessed and transformed. Then we, privileged through the Sacrament would go out and continue the work of the Mass in our lives. This was at a time when the Mass was in Latin, a language that most people could not understand. The priest had his back to the people and the actions of the Mass were a mystery. When Pope John XXIII announced that there was to be a Second Vatican Council we in the YCW were excited, expectant and ready for the renewal hoped for from the Council. 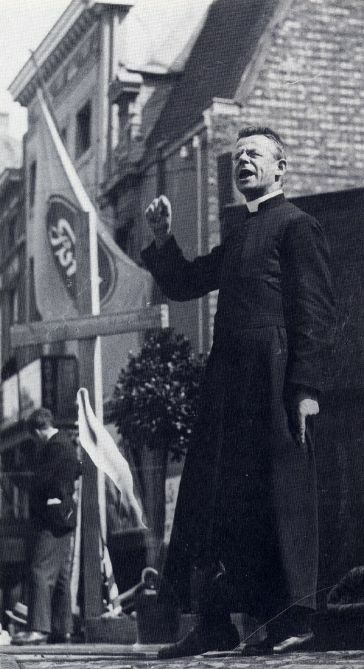 The YCW movement was strong in the Church, with priest Chaplains who believed in young people’s ability to bring about change for the better and saw the Church of the future in young people. I believe there is a renewed openness to the work of the Holy Spirit. YCW’s of my period, that I am in touch with, are actively committed to Life and Church. They and I recognise that the YCW was the humus that enabled growth for the journey of life. We believe implicitly in the need for the YCW today in the Church and the World. I came into the YCW in the late 50’s, early 60’s after attending a social event at St Augustine’s, Warrington. Maureen Lally had organised the event to introduce us to the YCW and the following week we went to our first meeting, prior to which some of us had to prepare for it. Every parish in Warrington had a YCW section and we met with them every month. We also met with the wider area St Helens and Liverpool. We quickly learnt that the YCW was bigger than just our parish, our town. All of our activities were structured around the method, See, Judge and Act, probably the most valuable concept I learned and appreciate from my time in the YCW. Each week we read and reflected on a short piece from a Gospel, exploring how we might relate and apply this to our lives. After which we considered and reflected on an element of our lives in relation to work, home and leisure. Through this we became more unified and aware that we had a right to play a more significant place in all aspects of our work and life. Cardijn called the YCW a University of Life and talked about the value of every young worker. The methodology we learned and applied increasingly in our lives gave us a tool of formation, learning and direction which was the dynamic of our growth and activities. After leaving the YCW I trained to be a teacher and in the margin of my Education Paper I wrote See, Judge and Act. I knew that if I could write my paper around these words it would prove that I knew how we learned. I passed and became a teacher. The Transition from school to work and the lack of guidance and training given to young workers both in the choice of work or career and the lack of training in the workplace which would enable them to make more fulfilling and fulfilled roles as employees. Leisure time was another area of young people’s lives which was considered. Through this campaign we were able to gather the true ‘facts’ of how young people were engaged in their world – our world. We gathered the facts and testimony and were able to make representations to the appropriate authorities. During this time young people were beginning to be recognised as a significant section of society. They lived in that in between area of school to work, childhood to adulthood. They had different needs, hopes and aspirations but facilities for young people to meet were not as defined as now. The Government commissioned a report on the life of young people at this time, The Albermarle Report. The campaigns which we in the YCW had been engaged in were absolutely about the life of young people in work and leisure. We had accumulated facts and evidence about what they were doing and were interested in. With this evidence we drew up our report for this Government Commission. Reading the synopsis recently I could see that what we contributed became very much part of the substance of the report.